Last year New Jersey joined the Interstate Wildlife Violator Compact, a multi-state agreement designed to 1.) enhance protection of wildlife resources in member states, 2.) provide equal treatment of non-resident hunters/anglers/trappers, and 3.) improve compliance with citations or summonses issued for wildlife violations. Responsible hunters and anglers want wildlife violators removed from the population of ethical sporting enthusiasts. Under the Compact, information about suspension of sporting license privileges for people convicted of wildlife violations in New Jersey will be shared with participating Compact states. The other Compact member states determine if the individual would also be suspended according to their own state laws. Similarly, New Jersey will be provided with information on individuals suspended for convictions under the law of all Compact states. When reviewed, if the violation(s) would lead to suspension under New Jersey’s laws, that individual’s privileges will also be suspended in New Jersey. IMPORTANT NOTE: If an individual has a wildlife license or privilege suspension in any Compact state, it is the individual’s responsibility to first contact the licensing authority in the state where they intend to hunt, fish, trap, harvest shellfish or otherwise take or possess wildlife to determine their eligibility before purchasing any license or engaging in those activities. Under New Jersey law, two convictions of any violation of the fish and game laws of this or any other state within five years will result in a two-year hunting and fishing license suspension. 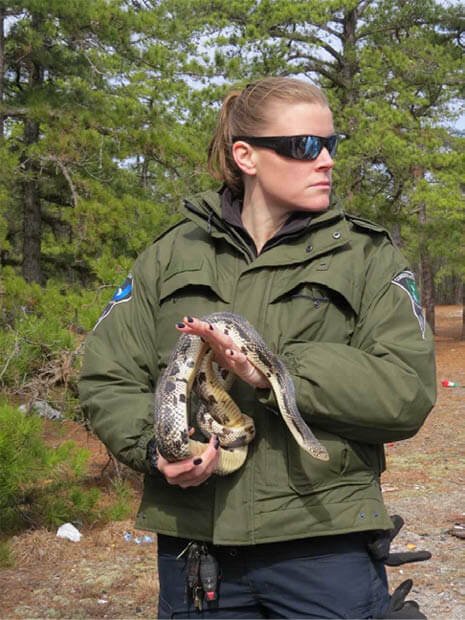 Conservation Police Officer Nicole Carman is among Fish and Wildlife’s Bureau of Law Enforcement officers trained to deal with the illegal taking of wildlife, like this northern pine snake, a threatened species in New Jersey.